Lake Tahoe is an Alpine Paradise located high in the Sierra Nevada Mountain range, on the border between California and Nevada. Lake Tahoe is the highest, largest and deepest fresh water lake in the western United States. Sitting at an elevation of 6225 feet, Lake Tahoe is the second deepest lake in the United States and the tenth deepest in the world, with a maximum depth measured at 1,645 ft (501 m), and an average depth of 1,000 ft (305 m). Lake Tahoe’s water is so pure that it has a water clarity of about 70 ft (21 m) deep. 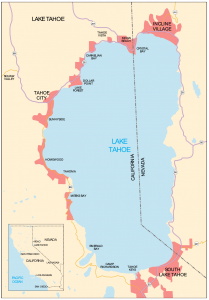 Lake Tahoe Map/Facts: Lake Tahoe is about 22 mi (35 km) long and l2 mi (19 km) wide and has 72 mi (116 km) of shoreline and a surface area of 191 mi2 (495 km2). The floor of the Lake Tahoe Basin is at an elevation of about 4,580 ft (1,396 m), which is lower than the surface of the Carson Valley to the east! Cities Near Lake Tahoe provide world class opportunities for ski vacations including Squaw Valley in Tahoe City; Heavenly in South Lake Tahoe; North Star in Truckee and Diamond Peak in Incline Village to name a few. Lake Tahoe was named “America’s Best Lake” by USA Today. It is ranked the No. 1 ski destination with Rand McNally and Orbitz and the No. 1 travel destination with TripAdvisor. Enjoy the Lake Tahoe Gondola and shops at Heavenly Village, the night life of the casinos, fabulous dining, fishing, hiking, camping, skiing, water sports and any high sierra sports or outdoor adventure you can conceive of. For more information on traversing the mountain passes with your truck or RV check out the Mountain Directory: A Guide for Truckers, RV and Motorhome Drivers. It is an e-book with interactive maps and description of roads and passes to help you plan the best travel route. We hope you are able to visit our community for an unforgettable vacation! I visited Lake Tahoe a long time ago while on a 3 state, 2 week long bus tour in CA, Arizona and Nevada. Details are not completely vivid but I do remember that Lake Tahoe was a gorgeous area. The trip was during the summer and the serenity of the large lake was almost breathtaking. I was unaware of just how deep Lake Tahoe is, you mention it as being the 10th deepest lake in the world, and in the U.S. at #2. I noticed in your about me page that 5 years ago you moved to Lake Tahoe after having visited it many times in your life before. I feel the same way about Hawaii, having visited that gorgeous state on 6 occasions in my life. $$$$ however with the high cost of living in that state, it is going to preclude me from ever moving there permanently. With the available skiing in the winter months I’m sure that tourism is a boon for the area. The picture logo at the top of the article said it all. What a spectacular wide-angle depiction of the beauty that is Lake Tahoe! Thank you for sharing this article, Wendy! We sure would like to have you come back Jeff. Ski season is great but summer is out busiest season with the 4th of July being the real highlight. We have the highest ranked fireworks show this side of the Mississippi. With the camping options in the area, you can even make it work on a budget. Of course, with some inside information from locals (like me) you can have a great ski weekend on a budget as well. Hope to see you back in Lake Tahoe again soon. I loved your article about Lake Tahoe facts. It is really one of those places that I have always wanted to visit but as of yet I have not made it. I can understand why you would move there after reading your facts about it. I had no idea it was as big as it was. Thanks for this great piece and I will come back and check out the rest of your site soon. Thank you for visiting my site. I hope you are able to come to Tahoe soon and sample our hospitality! Life is better at the Lake.